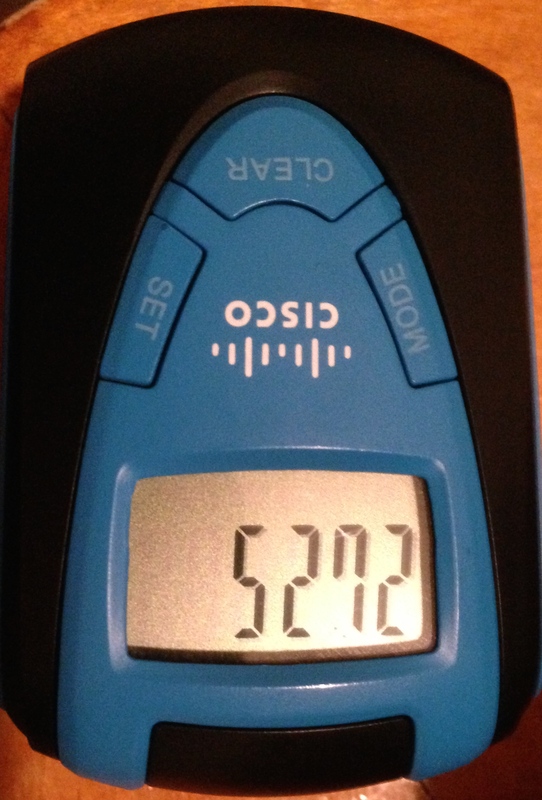 It’s that time of year again when I break out the Official Unofficial #CLUS Pedometer. Today wasn’t a very busy day and I didn’t actually have any technical sessions, so the count is pretty low. Not stellar numbers, but I assure you they will be bigger tomorrow! Today consisted of a morning of last minute studying for the CCIE R&S written, followed by failing the CCIE R&S written, and in turn followed by regret for wasting my “free” exam on a test that I was pretty sure I wasn’t going to pass. Oh well, hind sight is 20/20. If I can find some time later this week, I have a couple other exams I’m thinking of taking that I’m much more likely to pass. I don’t think I’ve left a Cisco Live without passing a test, yet. I spent most of my afternoon catching up with old friends and meeting new ones at the Social Media Hub as people started to arrive for the conference in force. It was a good time talking about all kinds of mostly geeky stuff. Later in the afternoon was the official tweet up with probably a couple hundred people powered by caffeine and sugar. Meeting more people and doing more geek talk. After meeting with people for a bit, a group of went over to the Cisco Empowered Women’s Network session. We went over primarily to see Amy Lewis (@commsninja) speak, but ended up staying to hear Carlos Dominguez (@carlosdominguez) speak as well. Both were very good talks. Amy spoke about social and how it can be used for you and your career. Carlos’ talk was about how these tools are both disruptors and enablers and how they can be used for the greater good and to create change. Both were humorous and informative. I suspect some of the earlier talks must have been pretty good, too. If you want to check out the video, it should show up at this URL sometime in the next few weeks: CEWN-1000 – Cisco Empowered Women’s Network – Today. Tomorrow. Transformed. On Monday, the real learning begins.